Getting set for warmer weather, Checkers and Rally's introduce new Island Slushies. The new icy drinks are made with Minute Maid and fruit. 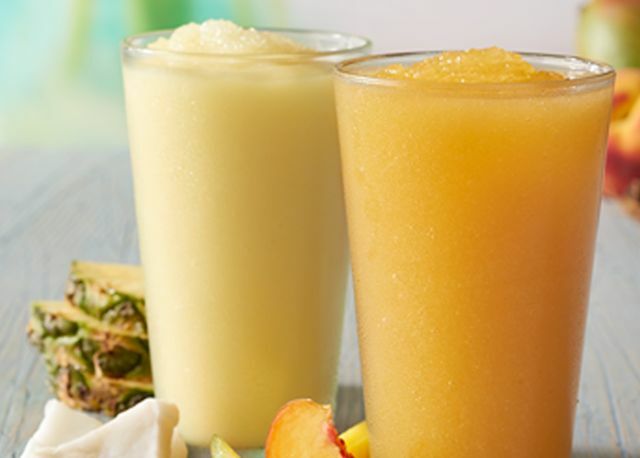 Island Slushies come in two flavors: Carribean Colada and Peach Mango. The tropical beverages can be found for a limited time at participating Checkers and Rally's locations. The sister fast food chains also serve Kool Aid Slushies on regularly as part of their "Chill Stop" menu along with Smoothies. The Kool-Aid Slushies come in Tropical Punch, Blue Raspberry, and Watermelon flavors, while the Smoothies come in Super Strawberry and Mango Palooza varieties.